By Darragh Mowlds | November 19, 2013. As we enter Oscar season we expect the standard of films to increase. 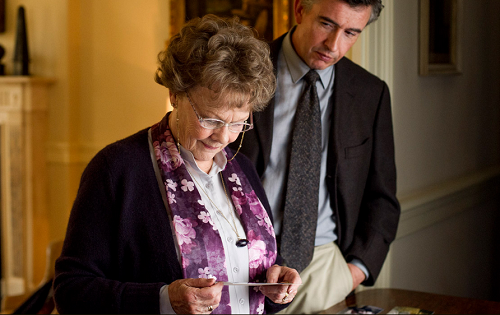 ‘Philomena’, starring Judy Dench and Steve Coogan does not disappoint. Dench plays the film’s title character, a woman who opens up about her son, who was taken from her by nuns 50 years earlier. Coogan (TV’s Alan Partridge) adds some necessary comedic moments to the plot, but also shows that there is a lot more to him than just comedy. He puts in an excellent performance as flawed and cynical journalist, Martin Sixsmith. Flashbacks to Dench’s character’s past in the convent provide some of the film’s saddest and most distressing moments. From her nearly fatal childbirth, followed by her son being given away, the audience is left deeply saddened and sympathetic towards Philomena. Dench herself provides some wonderfully comedic moments, at one point calling Coogan “a feckin ejit” for his cynicism towards God and the Catholic Church. In essence she plays a traditional Irish mammy, whose faith in God is unwavering despite all the hardships that she has suffered at the hands of the church. Putting Dench and Coogan together could be viewed as either a massive risk, or a stroke of genius. However, the two English actors play off each other extremely well, and the whole film focuses around them and their relationship. ‘Philomena’ is a complex film, in that it can make you laugh and cry within the space of one scene. It achieves this on several occasions throughout the film. This isn’t a film that preaches to its audience, it’s just looking to tell a story. It describes the incredible story of a woman who is not corrupted by hatred of her past. From start to finish, the audience is absorbed into one woman’s quest to find her past and her child. There are very few films you can describe as perfect, but this one comes incredibly close.